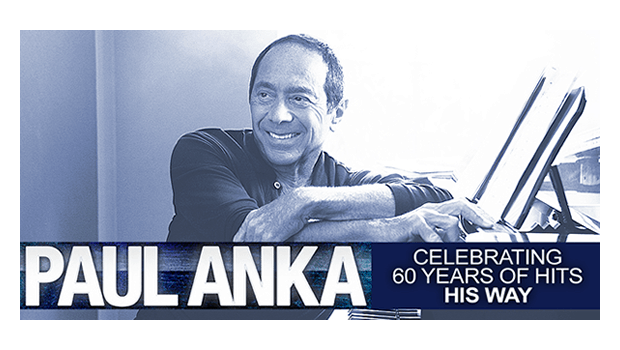 Singer, songwriter and actor, the legendary Paul Anka performs live at the RP Funding Center on February 1st at 7:30 p.m.
Ottawa, Canada native Paul Anka wasted no time in starting his music career. Starting with his own group at the age of 13, Anka tenaciously paved his path to musical success. With this trailblazer attitude, he opened windows of opportunity thrusting himself into success through the 50’s, 60’s, and 70’s writing hits while honing his craft. So confident in his talent as a songwriter, he continued to write hits for artists such as Buddy Holly, Connie Francis, The Tonight Show with Johnny Carson, Sinatra and more. A few of Anka’s impressive awards include a Canadian and Hollywood Star on the Walk of Fame and appointment to The Order of Canada. A recipient of the French Country and Government Award and The Prestigious Johnny Mercer Award at the 2008 Song Writers Hall of Fame. Billboard named Anka “21st most successful artist in Billboards history” while also being the only artist in Billboard history to have a song in the Top 100 during 7 consecutive decades. Tickets go on sale August 18, 2017 at 9:30 a.m. Ticket prices are $93, $83, $56 (other fees may apply) and are available by visiting the RP Funding Center Box Office, calling toll-free 888-397-0100, and online at www.rpfundingcenter.com.